Tachibana Genya is a director of a small-time production studio. Out of nowhere, Gin Ei Studios, a big name in the industry, gives him a mission: to create a documentary to celebrate the 70th anniversary of Gin Ei Studios. Genya and his cameraman go on a journey to find Fujiwara Chiyoko, a once famous actress who has decided to life the rest of her life in seclusion, cut off from the rest of the world. Genya is obsessed with the life of Chiyoko and her story. Miraculously, Genya and his cameraman find Chiyoko, who is a complete hermit now. It seems as if Chiyoko has not changed at all. Although she lives in seclusion, she has the same personality as ever before. Genya gives Chiyoko a key that he found by the studio, and then the memories of her life come back to her. What truths will be unraveled through this interview? What aspects of her life made her so special to Genya? Is there more to this anime than the synopsis? Obviously the answer is yes. 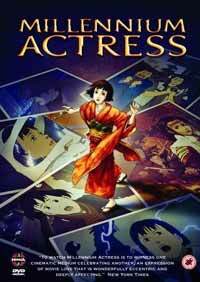 There is a LOT more to Millennium Actress than meets the eye. Think of Millennium Actress as Forrest Gump, anime style. The key, the key that opens the door to her past, triggers the story of her life, similar to how the feather starts Forrest Gump's tale. There's also a love interest in this one, similar to Forrest Gump (noticing a trend here? ), who is introduced as well. As the story goes on, the times change as well. Millennium Actress is distinctly Japanese, and can never be completely understood on a universal level by all because of the bits of Japanese history that are incorporated into the story. Little Chiyoko lived in an extremely strict Japanese family in pre-war times. She tells of her very early childhood, what her family was like, how she met her love. Then comes World War II, then the 1950s etc, etc. She tells Genya of past events that were locked up in her fragile mind for many, many years. Not only is Chiyoko an excellent character - so is the obsessive otaku Genya. He is so absorbed in her story that he feels as if he's actually in the story. This concept is EXTREMELY symbolic. The small roles he plays in her life stories are always roles of protection, whether guarding her during battle or saving her during an accident near a space shuttle. The roles that Genya plays show how strongly he cares for Chiyoko. Not only that, but the way he is incorporated into the story practically pulls you into the story as well, and makes Millennium Actress even more intense. There's almost not even a need to speak about the brilliant artwork, animation, and soundtrack. The plot and characters behind it speak for themselves. I would see and adore this title even if it was drawn by 6-year olds with circle of paper and pink crayons. The story and characters are THAT good!! Even if DreamWorks decides to change their minds and constantly push back the release, it shouldn't stop you from seeing one of the best anime of all time. Recommended Audience: Millennium Actress does have its share of violence throughout the movie. But besides that, the emotional intensity and mature themes of the movie make this appropriate for teens and upward rather than younger children.